This photo was taken while on vacation in Tennessee. Thanks everyone for your comments. I was nervous about entering my first challege, but I am here to learn. So I need constructive feedback often. I appreciate it. A timeless work of art... a classic if I may say. The composition of this photograph is simply amazing. You have chosen a brave image of a cross as the most powerful shape in the world. 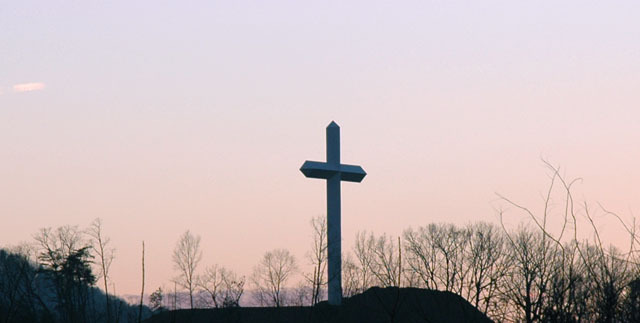 While the cross standing on a hilltop would have a strong enough message in its entirety, you have chosen to give the image even deeper meaning by added the title "At a Crosspoint". This title is a universal message that we can all find inspiring. To me, this represents a sinner that has taken a long journey through the world's pleasures and found himself standing here, staring a metaphorical cross on a hill. Which path will he take? The colors in this photograph are soft and speak of a gentle tone, which shows the softer more delicate side of the cross rather than the ugly nature in which the shape was created. It brings forth the love of the cross, and not the cruelty it was conceived for. Thank you, whoever you are, for blessing me with this photograph. Thanks IBKC! You really got where I was trying to go with this photo. Please be sure to comment on my photos in the future, it makes my day! i think i've seen and photographed that cross...is it outside of St Louis, MO? maybe a few hours away? Thanks for your comments. I wasn't sure about the cropping...I didn't want to crop to close and take away the feeling of solitude....yet some of the limbs I thought might be distracting. Oh well, not to bad for a first timer :) Thanks! I like the sky, a clearer shadow on the cross would be better. Nice idea and skyline - less central composition and more saturation would be better, and consider cropping out the wispy branches on the foreground left. I'm torn about the empty space here. Some suits this subject well, but I think there's maybe a little more than I would like best. Maybe a vertical crop from the bottom of the slope on the left, and a corresponding amount on the right? I dunno. The colors are pretty and I like the subject very much. Even the trees in the background, which might have been distracting, just (to me) give a nice sense of context. Proudly hosted by Sargasso Networks. Current Server Time: 04/19/2019 02:18:47 AM EDT.